The vintage-inspired Fifty Fathoms Bathyscaphe, first presented in 2013, is extending its range by introducing a 38 mm timepiece attired in abyss blue. 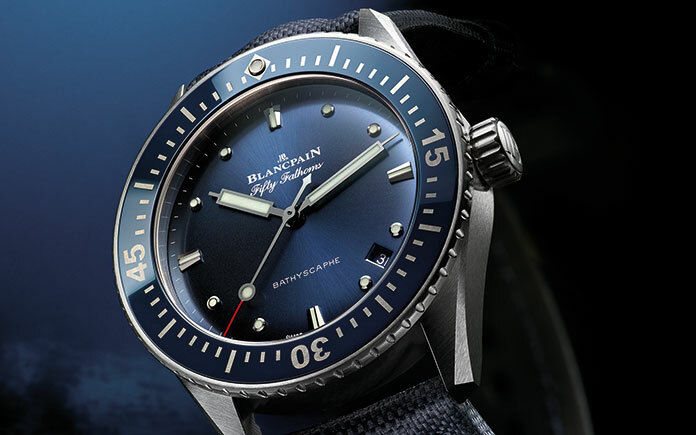 The new three-hand 38 mm Fifty Fathoms Bathyscaphe model appears in a blue shade particularly cherished by Blancpain in that it recalls the depths of the ocean. Various key characteristics of this timepiece are nods to the first Fifty Fathoms editions. Setting the perfect finishing touch, the steel bezel features a blue ceramic insert and hour-markers in Liquidmetal, an alloy known for its deformation resistance and its long-term stability. Blancpain’s Bathyscaphe diving watches were created in the late 1950s, with models first for men and later for women. In 2013, to mark the 60th anniversary of the Fifty Fathoms, the Bathyscaphe appeared with a new aesthetic reminiscent of the first editions. The contours were as sharply defined as their predecessors and the hands featured a traditional vintage look. Like any self-respecting diving watch, each model is equipped with a unidirectional bezel rotating counter-clockwise by small notches. Loyal to the original Bathyscaphe version, the luminescent dot on the bezel serves as an index for divers, enabling accurate alignment with the minutes hand and thereby defining the start of a given dive time. During the immersion, the seconds hand serves as an operating indicator. Water-resistant to 30 bar (approximately 300 meters), the Fifty Fathoms Bathyscaphe is powered by Caliber 1150. This movement distinguished by its robustness and its chronometric performance is equipped with two series-coupled barrels ensuring a 100-hour power reserve while guaranteeing constant energy, a significant technological feat. The modern and technical nature of the movement may be admired through a sapphire crystal case-back. Its silicon balance-spring is a relatively recent watch industry innovation that features several advantages: low density reducing its weight, greater shock resistance, as well as imperviousness to magnetic fields. These properties endow the balance-spring with an almost perfect geometry that enhances the movement’s isochronism and thereby improves the precision of the watch.